The Owen Gun, which was known officially as the Owen Machine Carbine, was an Australian submachine gun designed by Evelyn (Evo) Owen in 1939. The Owen was the only Australian-designed service firearm of World War II and was the main submachine gun used by the Australian Army during the war. Owen, an inventor from Wollongong, was 24 in July 1939 when he demonstrated his prototype .22 calibre "Machine Carbine" to Australian Army ordnance officers at Victoria Barracks in Sydney. The gun was rejected because the army, at the time, did not recognize the value of submachine guns. Following the outbreak of war, Owen joined the army as a private. About two years later, Owen decided to try a direct approach to a manufacturer, John Lysaght's factory at Port Kembla near Wollongong. Owen was acquainted with the daughter of the Hotel Illawarra publican, Hilda Condon in Wollongong and that Vincent Wardell was the manager of Lysaght's. Owen knew that Wardell was in habit of visiting the hotel on Friday nights. Owen asked Condon to give his prototype to Wardell. Condon agreed and passed the prototype over the counter to Wardell in a sugar bag, suggesting that he should take look at it. Wardell became intrigued by the weapon's simplicity and arranged to have Owen transferred to the Army Inventions Board, where he re-commenced work on the gun. The army continued to view the weapon in a negative light, but the government took an increasingly favourable view. The prototype was equipped with a top-mounted drum magazine, which later gave way to a top-mounted straight magazine. The choice of caliber took some time to be settled. As large quantities of .45 cartridges were available, it was decided to adopt it for the Owen Gun. Official trials were organized, and Lysaght made three versions in 9 mm, .38/200 and .45. Sten and Thompson submachine guns were used as benchmarks. As part of the testing, all of the guns were immersed in mud and covered with sand to simulate the harshest environments in which they would be used. The Owen was the only gun that still operated after the treatment. Although the test showed the Owen's capability, the army could not decide on a calibre, and it was only after intervention from the higher levels of government that the army ordered the 9 mm variant. The Owen went into production at the Lysaght factory at Port Kembla. Between March 1942 and February 1943, Lysaght produced 28,000 Owen Guns. However, the initial batch of ammunition turned out to be the wrong type and 10,000 of the guns could not be supplied with ammunition. 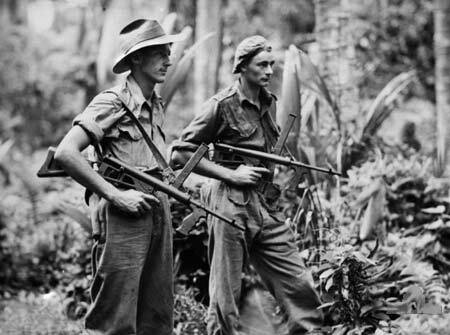 Once again government intervention overrode military bureaucracy, and took the ammunition through the final production stages, and into the hands of Australian troops at that time fighting Japanese forces in New Guinea. Approximately 50,000 Owens were produced from 1941 to 1945. Although it was somewhat bulky, the Owen became very popular with soldiers because of its reliability. It was so successful that it was also ordered by the United States and New Zealand. The Owen was used later used by Australian troops in the Korean and Vietnam Wars. It remained a standard weapon of the Australian Army until the early 1960s, when it was replaced by the F1 submachine gun. The Owen has a simple blowback design, firing from an open bolt. It is easily recognisable due to its unconventional appearance, including the magazine mounted on top of the breech, and a side-mounted sight. The placement of the magazine allows cartridges to simply fall into the chamber, rather than be pushed into it by a spring, which is more prone to failure and jamming. Another unusual feature is the separate compartment inside the receiver, which isolates the small-diameter bolt from its retracting handle by means of a small bulkhead. This prevents dirt and mud from jamming the bolt, and makes the Owen a highly reliable weapon. 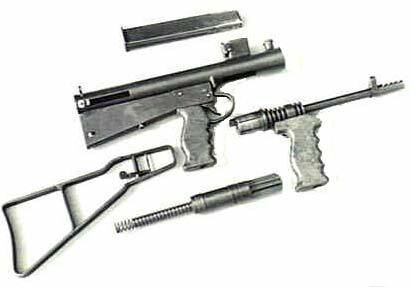 Like the Sten, the Owen had a non-folding wire buttstock, but also had pistol grips. To facilitate cleaning, the ejector is built into the magazine, rather than the body of the gun. This allows the barrel to be removed rapidly, by pulling up a spring-loaded plunger in front of the magazine housing. After removing the barrel, the bolt and return spring are removed in a forward direction, completely dismantling the gun.